It was a very rough night to be ABC last night, but a pretty good night to be CBS and a decent night to be the CW, Fox, and NBC. While most networks saw downticks somewhere last night, ABC hit some ugly lows last night. 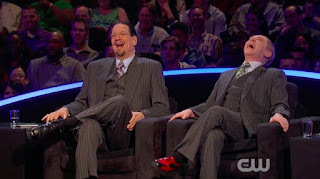 The Gong Show fell to a 0.6, two-thirds of its premiere rating. Boy Band was down to 0.5, tying a previous low point. Battle of the Network Stars was able to stay steady, but is it really a good thing to be steady at 0.7? As the Gong Show and Boy Band prove, apparently it is. Over on CBS, the Eye saw huge gains in its repeat-filled first hour, with the Big Bang repeat gaining two tenths to take second for the night and the Life in Pieces repeat gaining three to grab fourth place. They were both well above the occupant of the 10 PM dead zone, Zoo. Zoo stayed steady at 0.6, but it had some good news: at least it isn't the 0.5 from week 1. The CW's lineup stayed steady at 0.4 for Penn & Teller and 0.2 for Hooten & the Lady. NBC's Hollywood Game Night returned from a brief break at 0.9, making it steady once again. The Wall was down a tenth, but it's still above its Summer debut, and it's tied with its post-Voice second season debut. Beat Shazam on Fox dipped to a 0.8, a new low, while Love Connection ticked up to 0.7. Finals Update: Zoo (-0.1), the Big Bang Theory repeat (-0.1), the Life in Pieces repeat (-0.1), and Hollywood Game Night (-0.1) all adjusted down. Big Brother (+0.1) adjusted up to make CBS 4/4 as far as shows having finals adjustments.